Poyet wants final say over new signings. 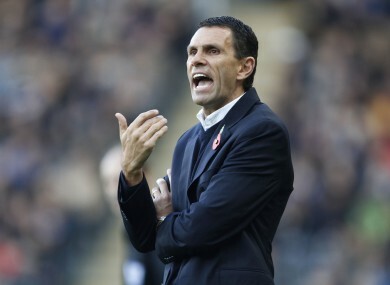 SUNDERLAND MANAGER GUS Poyet has suggested he will walk out on the club if he is not given the final say on transfers. Poyet only took over at the Stadium of Light last month, succeeding Paolo Di Canio following Sunderland’s dismal start to the season. The Uruguayan’s arrival has prompted an upturn in form, with the club winning three out of five matches in all competitions – including a derby success against Newcastle United – and climbing off the foot of the Premier League table. However, Poyet has made it clear he wishes to be in control of who is brought in during the January transfer window – rather than director of football Roberto De Fanti, who oversaw a raft of arrivals during Di Canio’s tenure. As published by The Guardian, Poyet said: “We talked about a position the other day and considered four players. “I picked two. One of the other two (selected by De Fanti) was a definite no. If that one is coming, I won’t be here. The player has to be the right one for me. If not, I’m not going to accept it. Poyet insisted he has no problem working alongside either De Fanti or Angeloni. “So far, everything is working fine. The connection and communication have been great,” he added. Email “Poyet will quit Sunderland if he doesn't get transfer control ”. Feedback on “Poyet will quit Sunderland if he doesn't get transfer control ”.